A welding torch started a fire that burned a chemical-coated pier at the Port of Los Angeles and sent clouds of smoke over the sprawling complex, forcing the closure of one school and an evacuation at another. The fire under a warehouse burned thick pier timber coated in creosote, a wood preservative. It smoldered for hours, according to fire officials. "Flames would blow up again, and they'd come right back at it," witness Wayne Ettel said. At a mid-day news conference, Los Angeles Fire Department officials said the fire was "under control." The South Coast Air Quality Management District issued a smoke advisory for areas near the ports of Los Angeles and Long Beach. Agency officials said people with respiratory health issues should remain indoors. Tuesday night, firefighters had to cut through a chunk of the dock to reach a portion that was still burning more than 24 hours after the fire had started. Fumes were not considered hazardous "beyond the immediate vicinity," said Los Angeles Fire Chief Ralph Terrazas, but air quality concerns led officials at private St. Peter and Paul Elementary School to cancel classes Tuesday. Nearby George De La Torre Jr. Elementary School remained open for morning classes against the recommendations of the LAFD. Students were evacuated just before mid-day to San Pedro High School John M. and Muriel Olguin Campus because of concerns about smoke and shifting wind conditions. "The winds have shifted direction and officials deemed that school should be closed," according to a school district statement. Students and teachers at George De La Torre Jr. Elementary School arrived wearing protective masks. About 700 students were evacuated after the air quality advisory was issued. De La Torre student Alexandra Santa Maria said classes were smoky. "And all the classes didn't smell so good so they moved us to another class," she said. Vanessa Ingram, a parent of a De La Torre student, said the Catholic school down the street was closed. "Why is it opening? Other schools are closed," she said. Health officials said initial air quality tests indicated elevated toxin levels, but those measurements did not exceed state or federal safety standards. Officials plan to continue to monitor those levels throughout the day. The fire began at about 6:30 p.m. Monday on South Fries Avenue. Firefighters used chain saws and heavy equipment to break up asphalt and cut out creosote covered 18-by-12-inch timber. They built a trench around the area that was burning to prevent the fire from spreading. "It took heavy equipment and heavy labor to create a fire break so the fire would not extend to the north," said Terrazas. "The tactic proved to be successful." The Los Angeles Fire Department used helicopters and five firefighting boats to attack the fire on a 40-acre site where cargo ships dock. 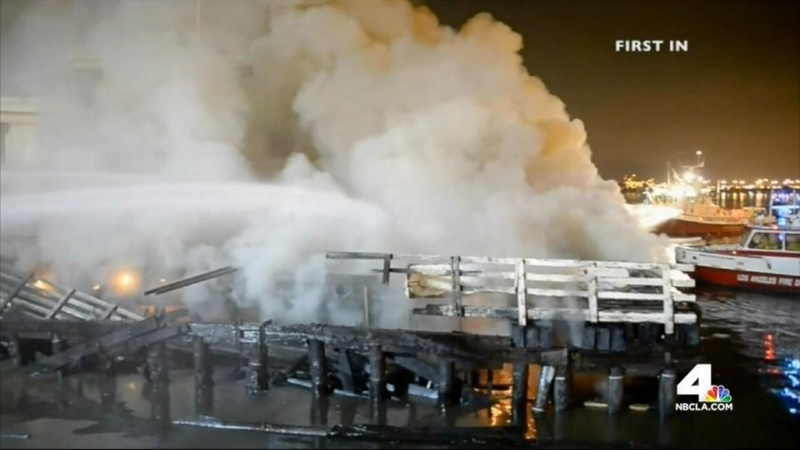 Dive teams fought flames from underwater and two Long Beach Fire Department boats joined the fight at the wharf, which is about 800 feet long and 50 feet wide. "At one point, there was fire the entire length of the wharf," said Terrazas. Two large ships and smaller boats tied to the berth were moved. More than 800 terminal employees were evacuated. Four Port of LA terminals were operating Tuesday and 11 voluntarily closed, according to Los Angeles Mayor Eric Garcetti. Longshoreman Ryan Dowe did not work Tuesday. "I decided not to even bother today," he said. "Came to take a couple pictures." Hundreds of people were forced out of their day's wages because of the fire. "I went back this morning. It was just more smoke in the air. It was like, we can’t work under (these) conditions," Maersk terminal mechanic Dennis Luna said. Capt. Jennifer Williams, of the U.S. Coast Guard, said foam used in the firefight and creosote residue was found in the waterway. A contractor was hired to clean up the pollution, which was detected during the Coast Guard's morning flyover, she added. As of Tuesday night, thousands of gallons of foam were still floating in the water. It is unclear who will be liable for the damage. The wooden wharf is likely beyond repair, and port officials said that it will be replaced with concrete. It is unclear whether the rest of the port would be replaced. "We're spending in excess of one million dollars a day. We will pay special attention to all the anomalies in the port to make sure we stay a step ahead of safety and security," Port Executive Director Eugene Seroka said. The port about 20 miles south of downtown Los Angeles has 43 miles of waterfront and handles billions of dollars of cargo each year. Patrick Healy and Gadi Schwartz contributed to this report.